Before leaving California, we returned to Sea World, San Diego for one last day of sea life and adventures. 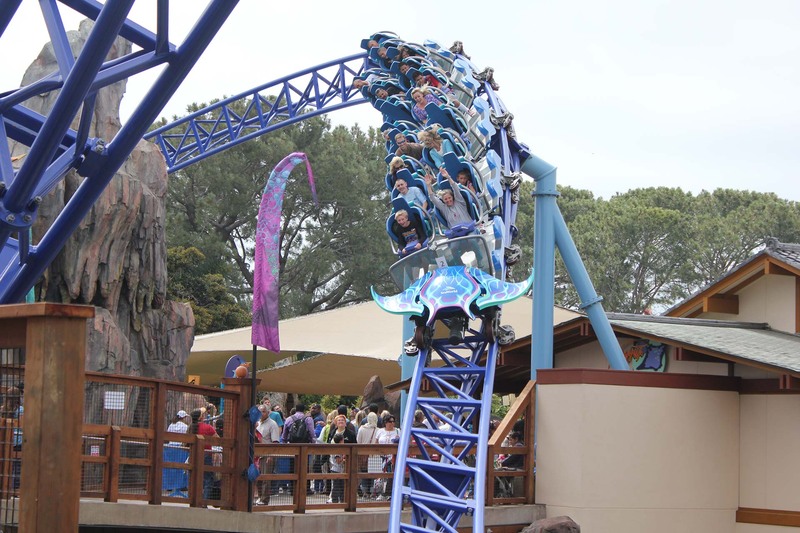 Manta, Sea World’s new mega-attraction, soars, dives, and twists like a ray while seamlessly transitioning you from the awe of watching rays in underwater flight to the sensation of actually being one. Featuring a unique “launch station,” we started our Manta experience enclosed in a launch tunnel with larger-than-life images of rays projected on a 270-degree enveloping screen. This state-of-the-art projection system is the first of its kind in the United States. Flying over the half-mile course in our giant manta ray-shape ride car, we felt the exhilaration of pulling 3 to 4 G’s through more than a dozen twists and high-bank turns, and a thrilling 54-foot drop. Manta combines the thrill and excitement of a coaster, with the educational and entertaining value of an incredible marine-life exhibit. This entry was posted in Adventure, California Entertainment, California Outdoors, Entertainment, Land Adventure, Ocean Adventures, Reviews, San Diego, USA and tagged adventure, bucket list, Bucket List Publications, Children, Family, Lesley Carter, photo, photography, Sea World, SoCal, southern California, USA, vacation by lesleycarter. Bookmark the permalink. Sounds like Fun !!!!!!!!!!!!!!!!!!!!!!!!! I have not been to Sea World …But all the cool stuff i have heard about it …..A big yes to going one day ……. Glad You had fun Lesley …. I love Sea World! I have a bunch of childhood memories at the one in San Antonio, TX. I’ve never really been to Texas. I drove through a few times, but never spent any real time there. What do you like most about it? What are the best things to do there? Do you live there now? I was and born and raised in Dallas too and absolutely LOVE it! Sea World San Antonio in August, though is a mistake. Waaaay too hot and humid. Like Reema said, the food is the best! Check out the State Fair in Dallas in October, Austin is always great, floating the Comal or Guadalupe River is a blast, and the spring thunderstorms are fabulous! Austin Texas, “Sixth Street.” Just sayin’…. To a native Texan, that’s like asking what’s there to do in the New England states. Texas is BIG and very diverse. It’s got everything from huge metropolitan areas to some of the smallest hick towns you’d ever want to experience. It’s got coastal living, plains, hill country, forests, deserts and beautiful canyons. Comments about food are right on, but don’t leave out Tex-Mex. YUM! Austin is a foodie mecca and there’s quite a large music scene there as well. Enjoyed hearing about your Sea World experience, but that Manta video about made me dizzy. No roller coasters for me. First, thank for visiting my blog. If you’re going to Texas, make a quick trip to Kreuz Market, in Lockhart (just outside Austin) for unreal barbeque. In South Texas, San Antonio and Austin and all around that area there is a chain of BBQ restaurants called Rudy’s that puts out some good stuff. They smoke turkey, sausage, pork, beef and all is tender. Also they have a creamed corn that is to die for. Fun places, long picnic benches and always a festive atmosphere. Love Texas! I do live here and have for 39 of my 40 years. I believe our best parts are the state parks. We have many rivers and beautiful landscapes. Dinosaur Valley is our favorite, located in Glen Rose Texas. If you drove through our state you spent a lot of time here! LOL That drive out of Texas is usually the longest part of our vacations. I’m dying to visit San Diego! We spent countless weekends there while living in California. I would never get sick of visiting San Diego. 🙂 I hope you make it there some day. Lived in SD for 11 years. And now I’m heading back. Life is too short to not live in San Diego. 🙂 Come and visit anytime! I’m so terrified of Roller coasters! I’m with you. This video was as close as I want to get! 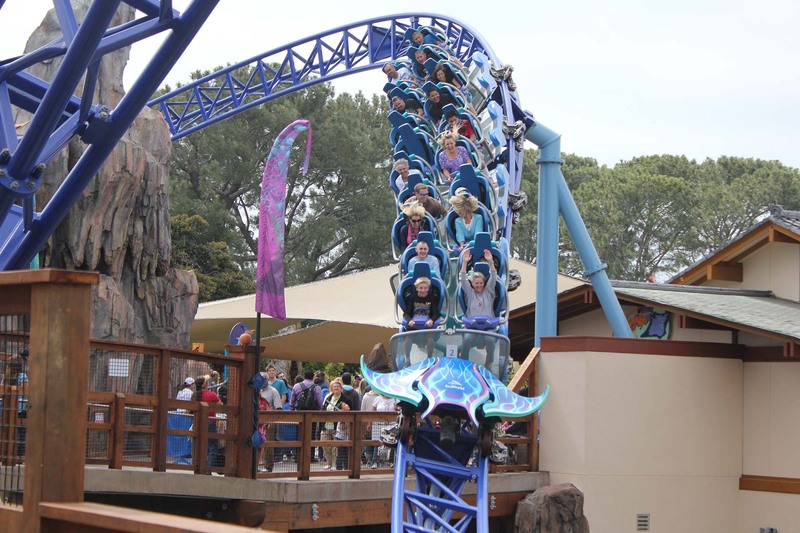 If you are wondering what is on offer at SeaWorld, San Diego, this is a great item to read. Wow! Sea World did not have a roller coaster when I worked there. Wish it had. Don’t look yet, I haven’t written the post yet, but I am nominating you for an award. I love your site, and what your are doing for others, as well as what you do for yourself. Congratulations! Thanks for encouraging me along the way. I rode this once only and I am a San Diego resident! Thanks for the cool video. I am going back on Thursday!! Glad you liked my post “Worth the Struggle.” We just got back from a San Diego vacation where Manta was one of the highlights! Sea World rocks. We had a fabulous time. My husband is from San Diego and actually worked at Sea World (he’s a marine biologist whose specialty is sharks), so I’m connected. I also love mantas. Wouldn’t that ride have been even better if the cars were enclosed, and you could actually plummet underwater during parts of it. Come on, Sea World. Let’s do it. p.s. I almost forgot to thank you for following my blog. Looking forward to more of your posts. I agree! Seeing all the advertisements for it – I thought it was over a big aquarium or a body of water. I like your idea for the enclosed cars or maybe it could plummet in and out through underwater glass tubes that are sticking out just above the water line. Does that make sense? I was just watching this manta video yesterday with my son! He was watching a short on the top ten coasters in America, and funny, I was thinking that it would be cool to ride that thing! Then I see you’re blogging about it! I could have found a restaurant for you to try greenlip mussels but you can always add them to your bucket list! Hope you won’t that long to try MOXXOR, though. Thank you for liking my new blog. http://celestialmusingsblog.com/2012/07/27/i-love-greenlip-mussels-and-heres-more-reasons-why/ I was just in San Diego for Comic Con where I spent the week-end signing autographs but my husband Nazim and I took a day off and went to Balboa Park to the art museum (he’s an artist)…it’s beautiful there! Thanks for liking my blog. And, glad you had a good time in my town! 😎 I am a scaredy cat and don’t go on roller coasters! I LOVE San Diego! We are hoping to road trip out there with our kids next summer. The kids can’t wait! Roller coasters are the ONLY ride I like. This was fun! Thanks for stopping by my blog. It gave me this chance to go on the Manta. Fist if all, thanks so much for checking out my new blog, Body & Skin by Rochelle! And, wow! I love, love, love your publication! The writing is fantastic and I’m psyched to try out some of the adventures being written about! I like roller coasters that go upside down IF my legs aren’t dangling loose below me. That freaks me out for some reason! I don’t like spinning anymore though… So no dangling body parts, and no spinning… Otherwise, it’s all good. Wow, this takes me back to the days of Great Adventure in my youth. I remember the heart-thumping spins and whips and thinking that it was my last day on earth. Haven’t been on one of those rides in years! Seaworld is awesome. After reading this I will have to go again to experience Manta. Nice post. Thanks for visiting my blog today. Come back soon. I love this video! Loved roller coasters of all kinds. Notice that love is in the past tense! Read redo on life from March on my blog to see why. That was quite a ride–so coasters hold no sway on me now!!! Thanks for visiting our blog again – we all need the encouragement from time-to-time! With this piece on the Manta and ly’s comment above, perhaps Forrest Gump should have referenced life to a ‘roller coaster’ rather than a box of chocolates? With other comments above about exciting things to see and do in the US, you might stimulate my desire to come to visit sometime? What an exciting ride at Sea World in San Diego. I have visited there and also their fantastic zoo. I am from Ohio and we USED to have a Sea World here and the kids are very disappointed that it is no longer open. Thanks for taking a Gypsy Road Trip! Woah this weblog is wonderful i love reading your posts. Keep up the good work! You already know, lots of individuals are looking around for this info, you can aid them greatly. I loved Sea World in San Diego when I lived there back in the early 90s. What a ride. There was nothing like it when we went, but it was a great experience. Thanks for your visit to questionsnow and you liking it! It really made my day to find that you liked a post on my blog. Upon checking yours out- I found myself intrigued by all of the interesting things you have done! What a wonderful way to document your adventures. I look forward to reading more! Thanks again! Pingback: My SIster, Lesley? | Imnotafraidofspidersanymore! Experiencing the ride through your video encouraged me to ride it – even though I am afraid of heights – it didn’t seem as high as others. In that case, I would try it! Thanks! I’m persuaded the Garden of Eden was in San Diego. looks fun … and thanks for stopping by and we are blessed our we and our kids will be covered by ACA !!! Thanks so much, Lesley! The ride and video were a wonderful treat! WELL DONE!!! Thanks for liking my post Indonesian on a Stick! But this roller coaster looks terrifying! Holy coconuts…a 54 foot free fall???? Space Mountain in Florida’s Disney World was my last roller coaster. After the first planet came hurtling toward my head I closed my eyes for the rest of the ride. We were in San Diego last fall, beautiful! Thanks of stopping by my blog, much appreciated!